The BBC Scottish Symphony Orchestra is regarded as one of Europe's leading orchestras and is a cultural flagship for Scotland and the BBC. 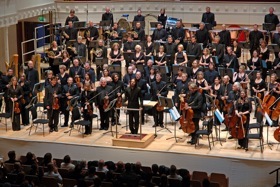 As befits its busy schedule of broadcasts on BBC Radio 3, BBC Radio Scotland, BBC Television and online, the orchestra has the widest repertory of almost any ensemble in the UK. A past winner of the Royal Philharmonic Society Award for best orchestra, the BBC SSO has also been the recipient of several prizes including three Gramophone Awards, most recently in 2009. The BBC SSO has greatly expanded its programme of concerts and recordings from its home base at Glasgow City Halls. It is one of the UK's leading supporters of new music and has established strong links with local communities through an innovative learning programme. Now in its 74th year, the orchestra performs in venues across Scotland, is a core part of the BBC Proms in London, appears regularly at the Edinburgh International Festival and is in demand at major festivals throughout the world. The eminent Scottish-born conductor Donald Runnicles becomes Chief Conductor of the BBC SSO in September 2009. He will succeed Ilan Volkov who will become the orchestra's Principal Guest Conductor.